bl.uk > Online Gallery Home	> Online exhibitions	> Asia, Pacific and Africa Collections	> Bombay Back Bay. 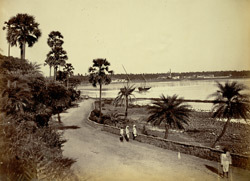 Photograph of Back Bay in Bombay from the 'Lee-Warner Collection: 'Bombay Presidency. William Lee Warner C.S.' taken by an unknown photographer in the 1870s. Originally Bombay was composed of seven islands separated by a marshy swamp. Its deep natural harbour led the Portuguese settlers of the 16th century to name it Bom Bahia 'the Good Bay'. In 1661, Bombay was ceded to England as part of the marriage dowry of Catherine of Braganza and was transferred to the East India Company in 1668. This view was taken from the foot of Malabar Hill on the northern promontory of Back Bay. Since the 18th century, Malabar Hill has been the most desirable residential area in the city of Bombay. In the 1860s, a private company considered a land reclamation project in Back Bay. However, it was not until the 1920s that this project was carried out with the assistance of the government.